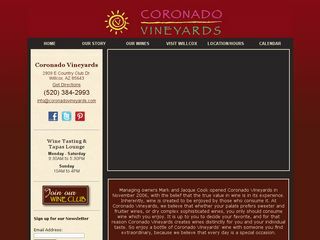 Short Business Description: Managing owners Mark and Jacque Cook opened Coronado Vineyards in November 2006, with the belief that the true value in wine is in its experience. Inherently, wine is created to be enjoyed by those who consume it. At Coronado Vineyards, we believe that whether your palate prefers sweeter and fruitier wines, or dry complex sophisticated wines, you only should consume wine which you enjoy. It is up to you to decide your favorite, and for that reason Coronado Vineyards creates wines distinctly for you and your individual taste. So enjoy a bottle of Coronado Vineyards’ wine with someone you find extraordinary, because we believe that every day is a special occasion. Managing owners Mark and Jacque Cook opened Coronado Vineyards in November 2006, with the belief that the true value in wine is in its experience. Inherently, wine is created to be enjoyed by those who consume it. At Coronado Vineyards, we believe that whether your palate prefers sweeter and fruitier wines, or dry complex sophisticated wines, you only should consume wine which you enjoy. It is up to you to decide your favorite, and for that reason Coronado Vineyards creates wines distinctly for you and your individual taste. So enjoy a bottle of Coronado Vineyards’ wine with someone you find extraordinary, because we believe that every day is a special occasion.